"Kill 'Em All" 3' x 5' Flag | BUDK.com - Knives & Swords At The Lowest Prices! Want to boost your intimidation factor to the max? Fly one of these menacing flags on your front lawn! It features a scary-looking red-eyed skull wearing a paramilitary-style beret in the center, a bloody knife and angel wings trailing. 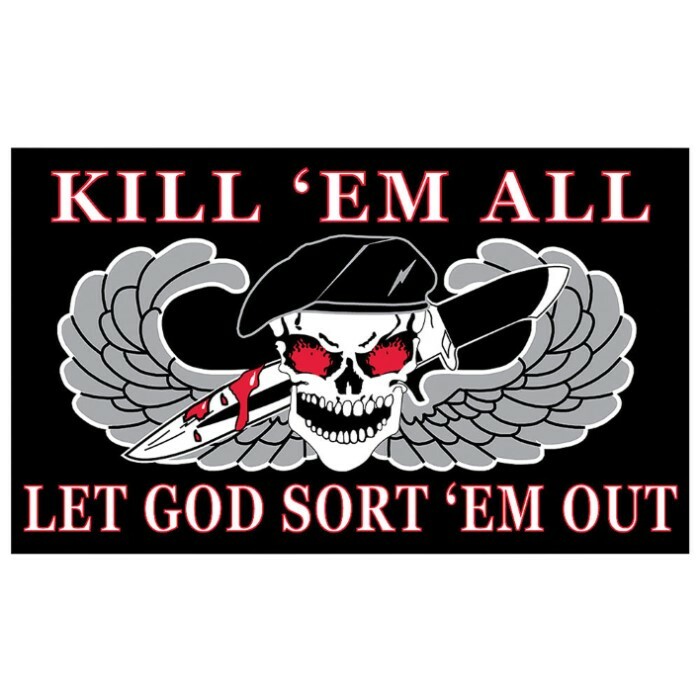 "Kill 'Em All; Let God Sort 'Em Out" is printed in bold capital letters above and below the fierce-looking focal image, all on a brooding black background. Fly it on a flagpole, hang it on a wall or ceiling or even frame it! Regardless, this eye-catching flag enhances any space in your home, office, workshop, studio or boat. At 3’ high x 5’ long, it's perfectly sized for practically any location or application. It includes sturdy metal grommets to facilitate hanging or flying, and its tough polyester construction prevents tears, wicks away moisture and resists fading, both indoors and out. Display one of these striking flags anywhere that's ripe for a bit of tongue-in-cheek terror! It makes a hilarious gift - sure to be remembered for years!